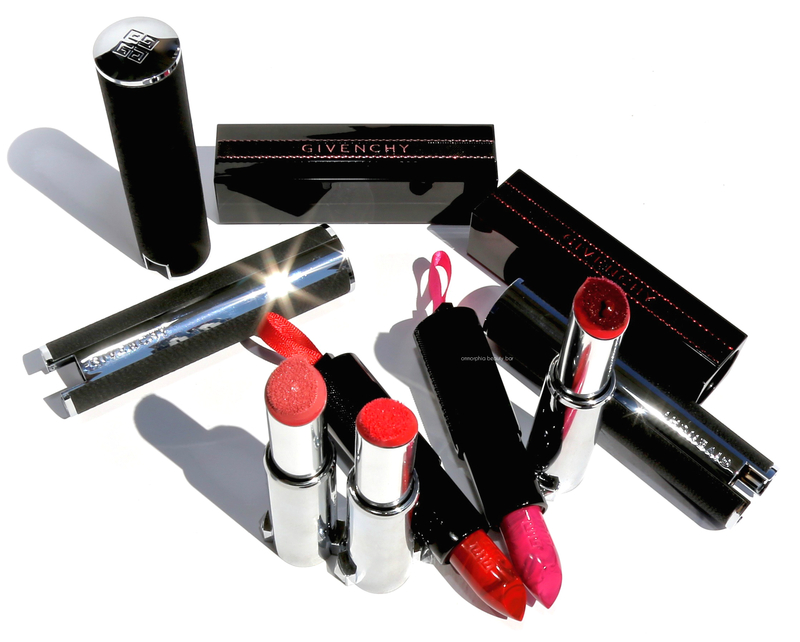 Givenchy is all about luxury, beauty, and detail … all three traits that are found with the brand’s latest launches, Rouge Interdit Marbre & Le Rouge Liquide. But riding high above that is performance and comfort: something that all of these definitely have … in abundance, I might add. 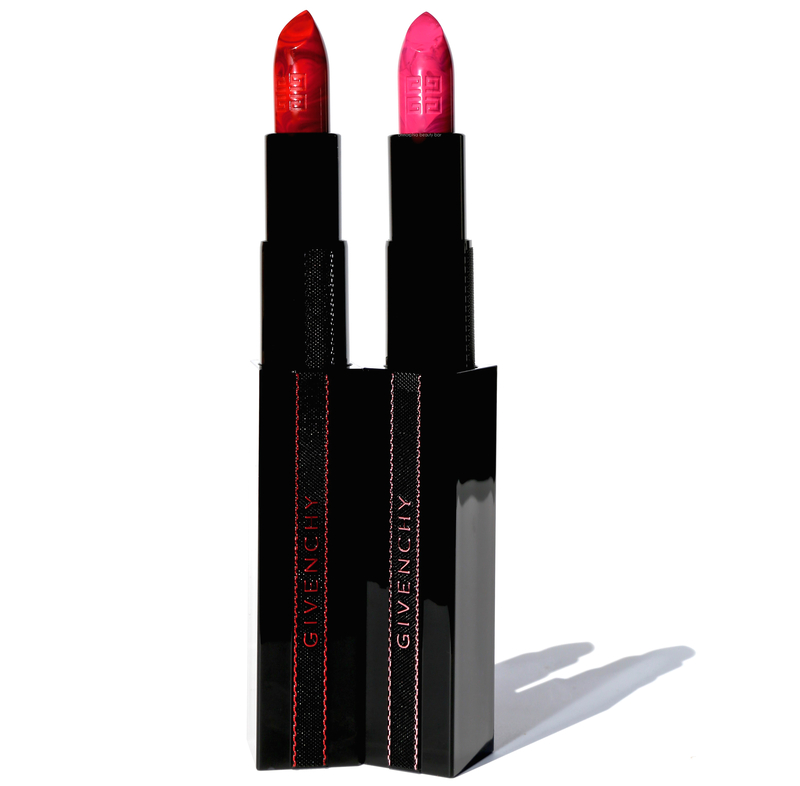 Rouge Interdit Marbre Lipstick (CAN $41.00/each) | Starting with the outer packaging and its visually gorgeous marbled pattern, each lipstick is housed in a rectangular casing that bears a fabric band along one side — a nod to its couture house origins, as well as a ribbon tab used to pull the lipstick out (side note: each band & ribbon is colour coded to match the shade on the inside, making it easy to know what you’re reaching for). The formula contains micro-crystals for depth and luminosity, along with AbsoluteColorComplex to ensure long wear and a vibrant finish. That’s just for starters; each shade is also formulated with eosin (the ‘révélateur’ part of the name) which adapts to your pH level — meaning the colour will develop according to that and therefore be unique to each wearer. 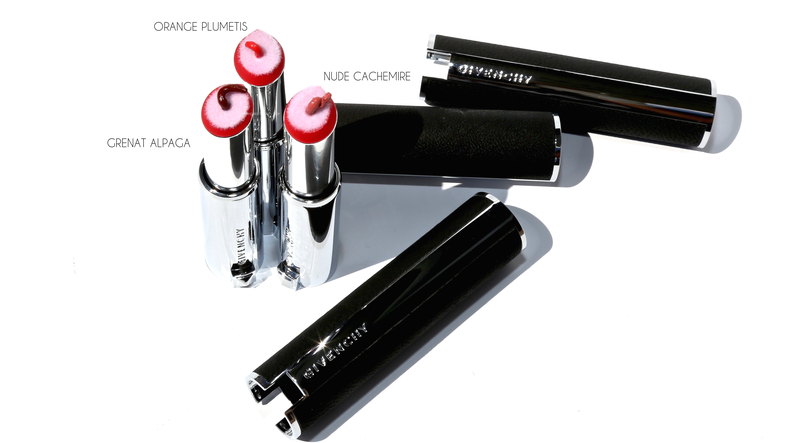 Taking things to a whole other level, is the utterly creamy feel of each lipstick — ‘buttery’ doesn’t even begin to describe it, and while the semi-sheer texture can be built up, it also provides excellent coverage that’s never overly thick-feeling. Each comes to a lovely shine at the end and leaves a nice stain behind when all traces of colour has gone. 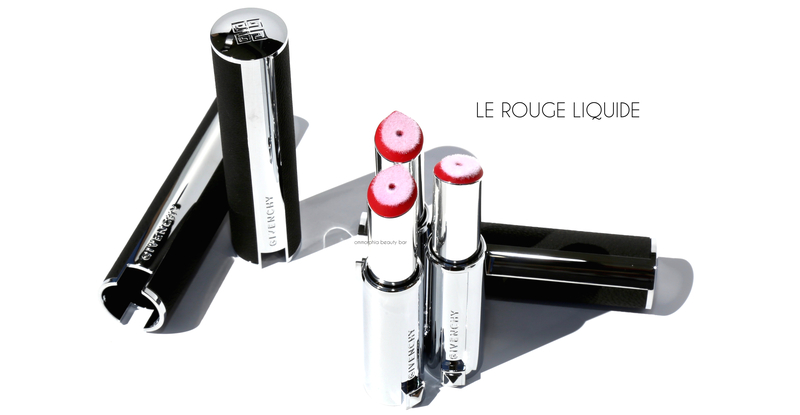 Other shades in the Rouge Interdit formula are available, although these are the only marbled versions. 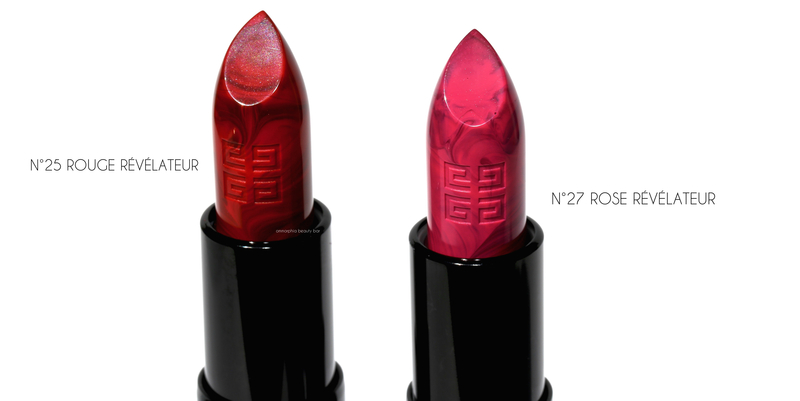 I immediately pulled out my original tube of Rouge Révélateur (reviewed here) to see if this 2018 version was identical; slight variances in the marbling patterns aside, as well as the fact that one has a black vs red ribbon pull, any differences in actual application are minor at best, as seen in the swatch below. Texture-wise they are the same, however. 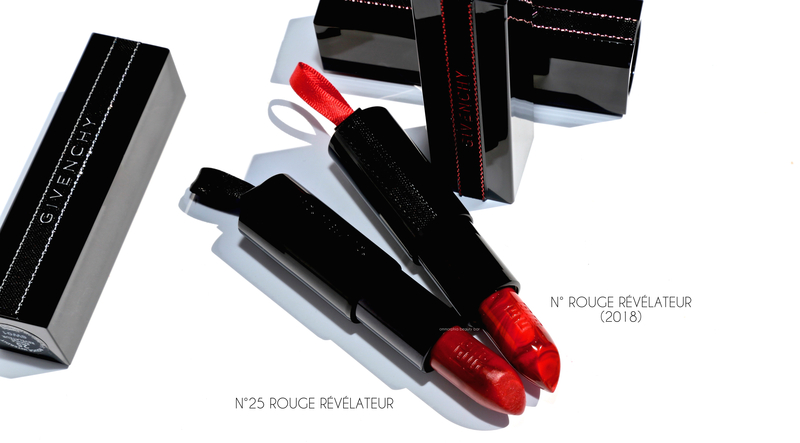 Le Rouge Liquide (CAN $44.00/each) | Of course Givenchy would enter the liquid lipstick market with something absolutely unique; uncapping the silver-studded & genuine leather casing reveals a pointed flocked applicator (surprise! 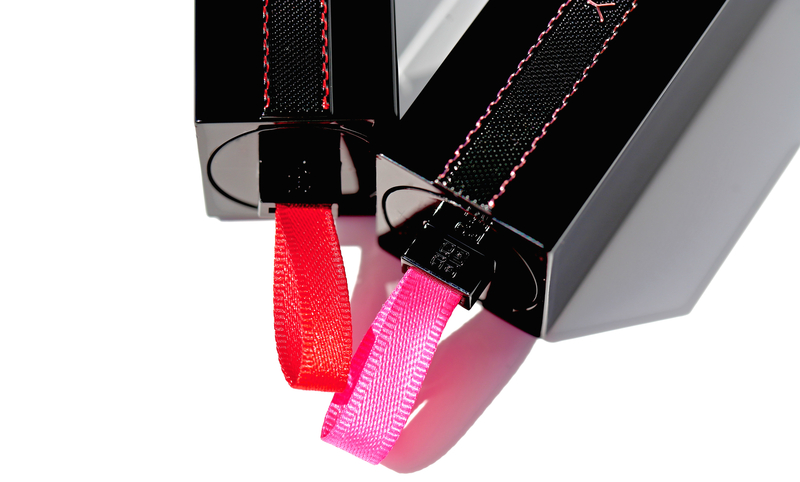 ), and you’ll need to twist the tube in order for the contents to emerge: a ribbon-like creamy texture that’s loaded in pigments for full on colour saturation. The formula contains Hyaluronic Acid Microspheres for excellent water retention (moisture), Gatuline Oil (smoothing effect), Clay Extract (long-lasting colour), Micro-Crystalline Wax (creaminess), and Micronized Pigments. They’re not without a slight learning curve, however; I suggest you go gently at first with the twisting up, as it might yield more product than you’ll need. 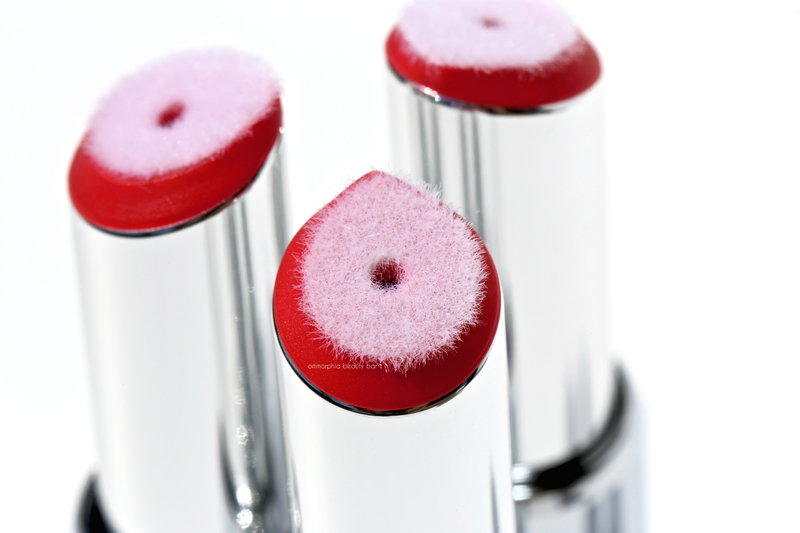 The applicator feels wonderful along the lips, but is not as effective if you’re looking for precision; that said, I actually prefer a more worn-in effect as I feel it looks more natural, not to mention current. 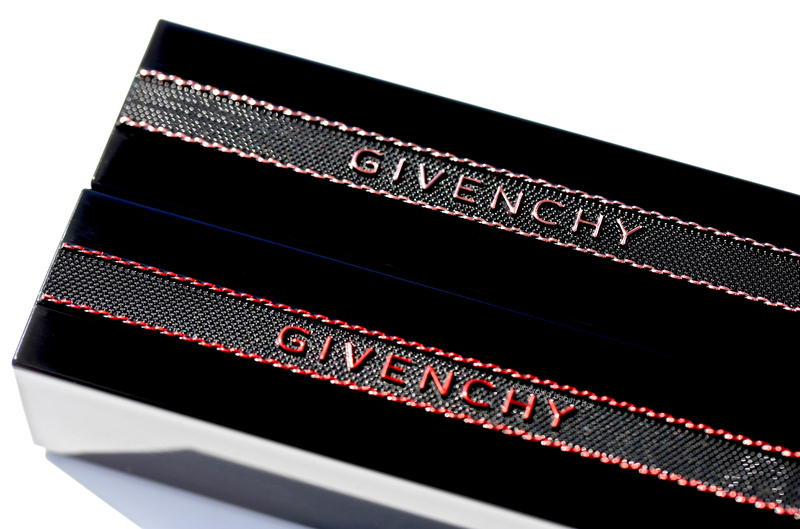 As to the actual lip feel, it is incredibly lightweight and comes to a velvet matte finish — no dryness in sight (thank you, Givenchy), although some transfer may occur as these do not fully set. That’s ok, as I’ll take any excuse to whip one of these out in public. There are 14 shades available in total.